Women Carrying Guns Is Not Practical? On February 24, CNN law enforcement analyst Tom Fuentes asked the question, “For a woman, where are you going to hide that gun during the day?” He continued with another question, “If you wear a dress, if you wear a skirt, are you going to have to wear a jacket everyday with a belt and a holster the way a detective on duty would do?” Was he actually that ignorant about women carrying guns? Yes, he actually asked those questions on national television in 2018. Dave Marris captured Tom Fuentes’ comments on his Facebook page. It is unfortunate that someone with such a public persona and lengthy career in the FBI is so ignorant about women and our ability to carry a firearm. Never before have their been more products available specifically tailored to women’s needs. There are holsters designed for all areas of a woman’s body that can be easily and safely concealed under everyday clothing. 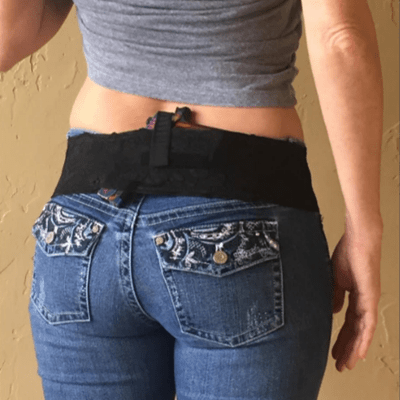 The traditional OWB holster that Mr. Fuentes references is used by some women who prefer to wear jackets or overshirts to cover the firearm, but that is only one option. There are quality holsters for inside the waistband (front, side, or back), corset/bellyband, bra mounted (both front and side), thigh and ankle holsters, boot holsters, and others. Millions of women know how to evaluate a concealed carry holster for EDC safety and functionality. Secondly, firearms themselves have become smaller and easier to conceal. It is not uncommon for women to have a variety of pistols that conceal better with different wardrobe choices or activities. We recently compiled a list of the best concealed carry handguns that our female pistol instructors carry on a daily basis. There are dozens of quality firearms on the market that are perfect for on-body carry for men and women to easily conceal. These firearms are secured safely in a holster unless the person determines, under the law, that lethal force is required. Finally, firearm safety is not a gender issue. All people must always follow the 4 Rules of Gun Safety. There are 3 safe places for a self-defense pistol and all men and women must adhere to these principles. Mr. Fuentes jested that a woman would leave her concealed carry pistol in her desk drawer and he showed his ignorance to the emphasis that our organization puts on the safe storage of firearms. We invite Mr. Fuentes and his colleagues at CNN to become more familiar with female gun owners, our gun-carrying lifestyle, values, and abilities. Many women come into gun ownership with the primary purpose of protecting themselves. They turn to A Girl & A Gun for holster information and responsible firearms training. We welcome them to the mindset of being their own first responders by carrying a handgun and taking charge of their personal safety and the safety of their loved ones. Are you a woman who carries concealed or know of one who does? What challenges or advantages do women face carrying concealed that men do not? Share your answers in the comment section. A Girl & A Gun Women’s Shooting League (AG & AG) is a membership organization whose events have been successful stepping stones for thousands of women into the shooting community and fostered their love of shooting with caring and qualified instructors to coach them. AG & AG breaks barriers for women and girls in the area of self-defense and in pistol, rifle, and shotgun shooting sports by welcoming beginners to learn the basics of safe and accurate shooting and providing experienced shooters with advanced-level opportunities. The club has more than 5,000 members in 48 states, with chapters that host recurring Girl’s Nights Out at more than 150 ranges throughout the nation. Can I please have her phone number !!! Having taught women for many years, and seen their transition in to safe carry of handguns, DONT EVER DEMEAN THE PISTOL TOTEING MAMA. the 5.11 tee shirt is a beautiful thing for double carry.